Click to viewThe first generation 30GB Zune—which 1.2 million of you already purchased—is getting all the new Zune's features. All. 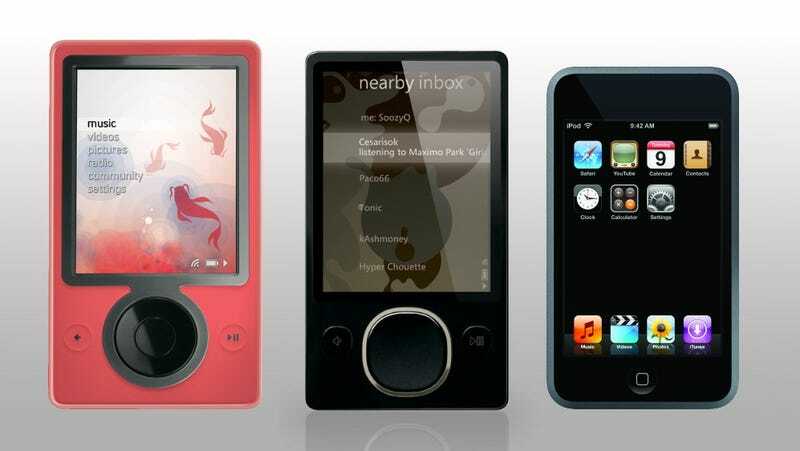 Sure, the new Zune is more of a half step forward than a completely new design. But Microsoft's done something fantastic here by rewarding first gen buyers with cool new stuff that also happens to be free by software upgrade. And talk about spin—Microsoft just took a middling jump in hardware and turned it into a genuinely good move for loyalists (as well as a PR miracle). Are you paying attention Apple? Contrast this to what Apple did between the iPhone and the iPod Touch. The iPod Touch is running the same OS as the iPhone, but it's artificially gimped. There's no email. There's no weather or stocks. No notes. No adding events to the Calendar. When old hardware can't support new features, that's not anyone's fault. But all this stuff that's right there in the software and costs nothing for Apple to put in, and they leave it out to artificially differentiate the product line. Apple iPod Touch Calendar Can&apos;t "Add" Appointments: Why, and What&apos;s Else is Being Crippled? Back to Zune. Not only is the old 30GB getting the new Wi-Fi syncing, it's getting the updated sharing features, the new codecs, the podcasts, and the new Windows Media Center TV on the go. It's essentially the new Zune, except thicker and with less storage space...which makes us ask why Microsoft would be so generous as to kill half the reasons why you'd ever upgrade to a new Zune. But as buyers, we'll just say thanks. If you're now interested in what Microsoft's throwing your way, you have the option of picking either the 4GB, the 8GB, 30GB or the 80GB, which only differ on size and storage space (plus the 80GB comes with premium headphones). You get to decide what you want. We appreciate the gesture of supporting your old hardware to the end, when it makes sense from a customer's point of view, and when technically feasible. (Keep ignoring the marketers, thanks.) No artificially gimped players here.